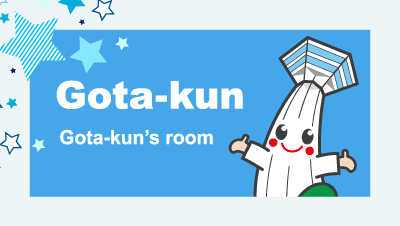 Who is the official mascot of the Goryokaku Tower, Gota-kun? The second-generation tower opened on April 1, 2006, as a new landmark of Hakodate. 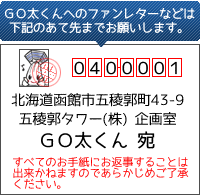 At the same time of the opening of the entirely new Goryokaku Tower, Gota-kun was born as an official mascot on December 1, 2006, so that the tower would become familiar to many people. His attractive features are the lightning rod and airplane warning lights over his head. 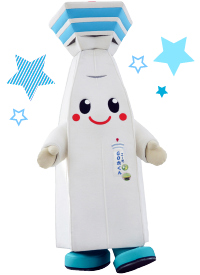 Every Saturday, Sunday and public holidays (April to October), Gota-kun makes an appearance at the atrium on the first floor. 1)	10:30 a.m. to 12:00 p.m.
2)　1:00 p.m. to 3:30 p.m. The lightning rod and airplane warning lights over his head. Cheerful and sunny disposition and hard-worker. To visit towers and to enjoy going to cafes. To see the views of Goryokaku and the city of Hakodate. To be a star in the tower world. All the images, text, and data shown on this website may not be reproduced or transferred without permission. *All the images shown are for illustration purpose only.